Man�s consummation consists in the attainment of his last end, which is perfect beatitude or happiness, and this consists in the vision of God, as was demonstrated above. The beatific vision entails immutability in the intellect and will. As regards the intellect, its questing ceases when at last it comes to the first cause, in which all truth can be known. The will�s variability ceases, too; for, when it reaches its last end, in which is contained the fullness of all goodness, it finds nothing further to be desired. The will is subject to change because it craves what it does not possess. Clearly, therefore, the final consummation of man consists in perfect repose or unchangeableness as regards both intellect and will. As might be expected from anyone who deals with the text being preached, in speaking of Ephesians 1:3,4 John Calvin devotes a good deal of time to the doctrine of election. In the second of 48 sermons on the book of Ephesians Calvin is concerned to magnify God and give assurance of our salvation (Calvin, John, Sermons on Ephesians, Edinburgh: Banner of Truth Trust, 1998, p.26), and explains at length that it is necessary for the doctrine to be known and proclaimed (pp.25,26). If this was done commonly and to all men without distinction, we should still have reason to magnify God. But now, when we see that some are hardened and others fickle, and that some go their ways without receiving any profit from what they have heard, and that others are altogether stupid, it is certain that it makes God’s grace more apparent to us, even as it is said by St. Luke that, at St. Paul’s preaching, as many believed as were ordained to salvation. According to Calvin, God’s grace is made more apparent to us precisely because it is not indiscriminate. The fact that elect find mercy and the rest are hardened does not disparage, but rather magnifies God’s grace. But how could he foresee that which could not be? For we know that all Adam’s offspring is corrupted, and that we do not have the skill to think one good thought of doing well, and much less therefore are we able to commence to do good. Although God should wait a hundred thousand years for us, if we could remain so long in the world, yet it is certain that we should never come to him nor do anything else but increase the mischief continually to our own condemnation. In short, the longer men live in the world, the deeper they plunge themselves into their damnation. And therefore God could not foresee what was not in us before he himself put it into us. It is abundantly clear from just the one sermon that Calvin believes in total depravity, unconditional election, and at least the presupposition of limited atonement – exclusive grace. He is undoubtedly a person of much greater genius than many who have been given the label formed from his name; but the Canons of the Synod of Dordt are manifestly not contrary to the overall tenor of Calvin’s reading of Scripture. To Plato is given the praise of having perfected philosophy by combining both parts into one. He then divides it into three parts, � the first moral, which is chiefly occupied with action; the second natural, of which the object is contemplation; and the third rational, which discriminates between the true and the false. And though this last is necessary both to action and contemplation, it is contemplation, nevertheless, which lays peculiar claim to the office of investigating the nature of truth. Thus this tripartite division is not contrary to that which made the study of wisdom to consist in action and contemplation. Now, as to what Plato thought with respect to each of these parts, � that is, what he believed to be the end of all actions, the cause of all natures, and the light of all intelligences, � it would be a question too long to discuss, and about which we ought not to make any rash affirmation. For, as Plato liked and constantly affected the well-known method of his master Socrates, namely, that of dissimulating his knowledge or his opinions, it is not easy to discover dearly what he himself thought on various matters, any more than it is to discover what were the real opinions of Socrates. We must, nevertheless, insert into our work certain of those opinions which he expresses in his writings, whether he himself uttered them, or narrates them as expressed by others, and seems himself to approve of, � opinions sometimes favorable to the true religion, which our faith takes up and defends, and sometimes contrary to it, as, for example, in the questions concerning the existence of one God or of many, as it relates to the truly blessed life which is to be after death. For those who are praised as having most closely followed Plato, who is justly preferred to all the other philosophers of the Gentiles, and who are said to have manifested the greatest acuteness in understanding him, do perhaps entertain such an idea of God as to admit that in Him are to be found the cause of existence, the ultimate reason for the understanding, and the end in reference to which the whole life is to be regulated. Of which three things, the first is understood to pertain to the natural, the second to the rational, and the third to the moral part of philosophy. For if man has been so created as to attain, through that which is most excellent in him, to that which excels all things, � that is, to the one true and absolutely good God, without whom no nature exists, no doctrine instructs, no exercise profits, � let Him be sought in whom all things are secure to us, let Him be discovered in whom all truth becomes certain to us, let Him be loved in whom all becomes right to us. If a powerful intellect were essential to the right understanding of Scripture, you perceive at once that to the mass of the world, who possess only common minds, it would be a mere dead letter; but as no higher intellectual powers are necessary than fall to the common lot of man, in connection with the spirit of docility and dependence on divine illumination which all may, if they will, possess, it is manifest that the Bible is fairly open to all; and that every individual is as truly responsible for his religious opinions as for his moral conduct. But when, as in Schleiermacher, feeling is detached from faith, from the religious representation, it loses its own quality and becomes completely independent of the categories of truth and untruth, good and evil. Then every individual feeling is already as such religious, true, good, and beautiful. And that was romanticism�s great fault as a whole. One then, naturally, also slips into the error of confusing and equating religious feeling with sensual and aesthetic feeling. Known to us all from history is the kinship between religious and sensual love and the passage from the one to the other. But equally dangerous is the confusion of religious and aesthetic feeling, of religion and art. The two are essentially distinct. Religion is life, reality; art is ideal, appearance. Art cannot close the gap between the ideal and reality. Indeed, for a moment it lifts us above reality and induces us to live in the realm of ideals. But this happens only in the imagination. Reality itself does not change on account of it. Though art gives us distant glimpses of the realm of glory, it does not induct us into that realm and make us citizens of it. Art does not atone for our guilt, or wipe away our tears, or comfort us in life and death. It never turns the beyond into the here and now. Only religion does. It is and conveys reality. It bestows life and peace. It poses the ideal as the true reality and makes us participants in it. Aesthetic feeling, accordingly, can never take the place of religious feeling, any more than art can replace religion. Granted, the two are connected. From the very beginning religion and art went hand in hand. The decline of the one brought with it the decay of the other. The ultimate driving force of art was religion. In recent years this fact is being acknowledged by increasing numbers of people who keenly realize the indispensability of religion to art. In religion, specifically in worship, the imagination has its rightful place and value. �Also the imagination, mind you, is involved in the religious process, not as the generative principle, but only as the principle of experience. The power of the imagination can never do more than shape the already available materials and drives; it is powerless to give birth to religion itself.� [Nitzsch, Lehrbuch der evangelische Dogmatik] The stage is by no means cut out to be a moral institution (Schiller). The theater cannot replace the church, nor is Lessing�s Nathan a suitable substitute for the Bible (Strauss). The ideals and creations of imagination cannot compensate for the reality that religion offers. Religious feeling, however intimate and deep it may otherwise be, is pure only when it is evoked by true ideas. The result, accordingly, is that religion is not limited to one single human faculty but embraces the human being as a whole. The relation to God is total and central. We must love God with all our mind, all our soul, and all our strength. Precisely because God is God he claims us totally, in soul and body, with all our capacities and in all our relations. Admittedly, there is order in this relation of a human being to God. Here, too, every faculty exists and functions in a person according to its own nature. Knowledge is primary. There can be no true service of God without true knowledge: �I do not desire anything I do not know� (Ignoti nulla cupido). To be unknown is to be unloved. �Whoever would approach God must believe that he exists and that he rewards those who seek him� (Heb. 11:6). Faith comes from what is heard (Rom. 10:17). Pagans fell into idolatry and unrighteousness because they did not acknowledge God (Rom. 1:18ff). But that knowledge of God penetrates the heart and arouses there an assortment of affections, of fear and hope, sadness and joy, guilt feelings and forgiveness, misery and redemption, as these are pictured to us throughout Scripture but especially in the Psalms. And through the heart it in turn affects the will: faith is manifest in works, in love (James 1:27; 1 John 1:5-7; Rom. 2:10, 13; Gal. 5:6; 1 Cor. 13, etc.). Head, heart, and hand are all equally�though each in its own way�claimed by religion; it takes the whole person, soul and body, into its service. For that reason religion also comes into contact with all the other cultural forces, especially science, morality, and art. Proudhon once stated: �It is astonishing how at the base of all things we find theology.� But to that statement Donoso Cortes correctly replies: �The only astonishing thing in that fact is Mr. Proudhon�s astonishment.� Religion as the relation to God indicates the place in which human beings stand in relation to all other creatures. It embraces dogma, law, and cult and is therefore closely connected with science, morality, and art. It encompasses the whole person in his or her thinking, feeling, and action, in the whole of his or her life, everywhere and at all times. Nothing falls outside of its scope. Religion extends its power over the whole person, over all of humanity, over family and society and state. It is the foundation of the true, the good, and the beautiful. It introduces unity, coherence, and life into the world and its history. From it science, morality, and art derive their origin; to it they return and find rest. �All the higher elements of human life first surfaced in alliance with religion.� [Bousset, Das Wesen der Religion] It is the beginning and the end, the soul of everything, that which is highest and deepest in life. What God is to the world, religion is to humanity. Nevertheless, religion is distinguished from all the forces of culture and maintains its independence from them all. Religion is central; science, morality, and art are partial. While religion embraces the whole person, science, morality, and art are respectively rooted in the intellect, the will, and the emotions. Religion aims at nothing less than eternal blessedness in fellowship with God; science, morality, and art are limited to creatures and seek to enrich this life with the true, the good, and the beautiful. Religion, accordingly, cannot be equated with anything else. In the life and history of humankind, it occupies an independent place of its own, playing a unique and all-controlling role. Its indispensability can even be demonstrated from the fact that at the very moment people reject religion as an illusion they again turn some creature into their god, thus seeing to compensate for their religious need in some other way. But when in Scripture and the church the revelation of God that appeared in Christ has become a constituent of the cosmos, a new dispensation begins. Just as up until this time everything had been prepared with a view to Christ, now everything is traced back to him. Then Christ was made to be the head of the church; now the church is made to be the body of Christ. Then Scripture was completed; now it is worked out. No new constitutive elements can any longer be added to special revelation now, because Christ has come, his work is finished, his Word completed. The question of whether the gift of prophecy (prediction) and of miracles has continued after the apostolic age and still continues is, therefore, of secondary importance. The testimonies of the church fathers are so numerous and powerful that for the most ancient times this question can hardly be answered in the negative. But even if those extraordinary gifts and powers have in part remained in the Christian church, the content of this special revelation, which is concentrated in Christ and recorded in Scripture, is not enriched by them; and if, in line with Augustine�s view, they have diminished or ceased, special revelation is not impoverished by this fact. The case is different when with Rome people believe in an ongoing progressive revelation in the tradition, or with the �enthusiasts� in a special inspiration of God in the pious individual, or with the evolutionists in the surpassibility of Christianity. Scripture clearly teaches that God�s full revelation has been given in Christ and that the Holy Spirit who was poured out in the church has come only to glorify Christ and take all things from Christ (John 16:14). -Herman Bavinck, Reformed Dogmatics, I. p.347. [Isaac’s] throat was to be cut, his body dissected into quarters, his bowels taken out, as if he had been some notorious traitor, and vile malefactor and miscreant, and afterwards he was to be burnt to ashes, that if possible there might be nothing left of him. And Abraham was supposed to start on all of this promptly, and yet was given time enough in the journey to anticipate its horrors. What did Abraham have to know and believe in order to even begin to go through with this? By what unshakable and unquestionable convictions did Abraham face and pass this most severe test? I. First of all, Abraham knew the absoluteness of God. God was ultimate for Abraham. This appears in two ways. A. Nothing was more important than God. This is the point that God highlights at the moment of crisis. Now I know that thou fearest God, seeing thou hast not withheld thy son, thine only son from me. Here was Isaac -Abraham’s son, only child of the beloved Sarah, living proof of the power of God; but Abraham did not withhold him. If it was a choice between God or Isaac, there was no question as to which it was to be. Isaac was never a contender. There was no competition. And all parents have to learn this: it could be in the case of children who die, or children who are rebellious, but they cannot be put in the place of God. And of course not only parents, but all people: the first commandment is still, Thou shalt have no other gods before Me. God was supreme to Abraham. And that supremacy of God in Abraham’s heart was matched by a similar supremacy in Abraham’s mind. B. What God commanded, must be done. This sounds simple, but this was more than just a test of devotion. In a way, it was a repetition of the test that Eve failed in Eden. You remember that God had told Adam that in the day he ate of the fruit of the tree of the knowledge of good and evil he would die. When the tempter spoke to Eve he contradicted that, and when Eve looked at the tree she could see that it was good for food, pleasant to the eyes, to be desired to make one wise. God had said that evil would come from eating: but Eve could see that the tree was good in every way. And so she trusted her judgment more than God’s revelation. She acted as though “bad” and “good” were something that existed independently of God’s will, and that right and wrong and good and evil could be decided apart from God’s word: and so she ate the fruit and gave it to her husband as well. In that situation there was a command which perhaps didn’t seem necessary, and it was rejected. But when we come to Abraham, it seems that the trial is more severe, because Abraham is given a command which is contrary to nature, and which was opposite to instinct, to law, and even to what God had said in the past (Genesis 9:6). The will of God is the supreme rule of righteousness, so that everything which he wills must be held to be righteous by the mere fact of his willing it. Therefore, when it is asked why the Lord did so, we must answer, Because he pleased. But if you proceed farther to ask why he pleased, you ask for something greater and more sublime than the will of God, and nothing such can be found. Let human temerity then be quiet, and cease to inquire after what exists not, lest perhaps it fails to find what does exist. God’s word was enough for Abraham. If God commanded him to kill his son, then killing his son was the right thing to do, however difficult it might be. God was to be obeyed, not questioned or resisted. The Lord was supreme in Abraham’s heart and mind. Now we should remember that God did stop Abraham from following through: it is certainly not His will that we should kill our children. We must accept whatever God does as right, however much it offends us, and we must do whatever God commands, however unnatural and hard it may seem. But what God has told us is that we must not commit murder -Thou shalt not kill. That applies of course to abortion, which I think is the most widespread form of murder in our nation. But it applies also in an area we don’t often think about -fertility treatments. There are many options available to those couples who are having difficulty conceiving to be able to have a child. But some of those options, like in-vitro fertilization, almost always involve the conception of more than one child -but not all of them will be allowed to live. The episode of Abraham, Sarah and Hagar shows that people will do quite desperate and repulsive things in order to get a child, and the fertility industry is filled with unsavory and wicked practices; but while God’s law says, Thou shalt not kill, God’s people must never be in the position of participating in the destruction of children, even if it happens as “collateral damage” in the process of getting a child. If that means not having children, then submit to God’s will in that regard, but do not violate His word. God gave that command, and then cancelled it, so of course, there was something for Abraham, and for us, to learn from God’s command and its suspension. He saw that God required consecration, that God does not hesitate to challenge the dearest treasures of our hearts for His own rightful place: Christ applied that teaching to us in Luke 14:26,27: If any man come to me, and hate not his father, and mother, and wife, and children, and brethren, and sisters, yea, and his own life also, he cannot be my disciple. And whosoever doth not bear his cross, and come after me, cannot be my disciple. God will be supreme: Christ will have our hearts. But there was something else as well. When Abraham surrendered Isaac to God, he got to keep Isaac. Christ announced that those who give up family and possessions for His sake and the Gospels will receive an hundredfold in this time (Mark 10:29,30). The only way to keep anything is to put it in God’s hand, to give it up to Him. Now that is not a guarantee. If you knew that by telling God that He could have this or that you would get to keep it, it would just be a mental game. When you abandon a project, a dream, a relationship, a possession to God there is no promise that He won’t take it away. No, the surrender must be real. But trying to hang on to something is not going to work. Nothing is yours to keep; God can do what He wills with everything you have and everything you are. It is God’s anyway, and you may as well recognize the fact. And when he had called the people unto him with his disciples also, he said unto them, Whosoever will come after me, let him deny himself, and take up his cross, and follow me. For whosoever will save his life shall lose it; but whosoever shall lose his life for my sake and the gospel’s, the same shall save it. Mark 8:34,35. You see the guarantee in the text: first of all, that if you try to save your life, it will be lost. What you try to cling to apart from God, without reference to His will, is inevitably going to be taken away. But when you turn everything over to God, you find that He has been very generous towards you, that your life has been saved, and that what you have lost is trash in comparison with Christ (Philippians 3:8). Abraham surrendered Isaac wholly to God: and not only was Isaac spared, but God again pronounced abundant blessing upon Abraham. There was also a vivid reminder for Abraham in what happened here, and Abraham fixed on that aspect when he gave a significant name to the place where these things happened: Jehovah-Jireh, the Lord sees, or will be seen. This means that God will provide, or (what amounts to the same thing) that God will manifest Himself on our behalf. I call it a reminder because Abraham had already announced this to Isaac. When Isaac asked, “Where is the lamb?”, Abraham replied that God would provide himself a lamb. We can apply this across the board, and in any kind of lack remind ourselves that God is the God of Abraham, the God who provided. But it is true of worship: God is the one who supplies what is necessary so that we may worship Him acceptably, as in this case he provided an acceptable sacrifice. And it is true of salvation: God is the one who provides everything necessary for our deliverance, as He provided for the deliverance of Isaac. And that leads on to another lesson which Abraham and Isaac would have learned from this event, the truth of substitution. Isaac was a condemned victim; but God interposed and saved him, and did so by means of a substitute. By God’s decree a ram had gone up that same mountain, and had gotten tangled and trapped in a thicket. God had appointed that a substitute for Isaac would be there at the very time when he was needed. So Isaac went free, but the ram was killed. Abraham offered up that ram in the stead of Isaac his son. They learned not merely that God provides, that God is the God of deliverance, but that God delivers through the provision of a substitute. Abraham’s son went free because there was a substitute to take His place. But years later, when another Father raised His hand against His son, no one called from heaven to prevent it; that Father killed His Son, and there was no substitute. Abraham’s son was delivered by a substitute; God’s Son, on the other hand, was not delivered because He was the substitute for a sinful people. II. In the second place, Abraham knew the infallibility of God’s promises. Perhaps the hardest part of this trial was that God called upon Abraham to destroy the child of promise. When God promised that Abraham would have a son by Sarah, Abraham had not believed that promise right away; he had laughed and asked for God’s blessing on Ishmael (Genesis 17:17,18). But God had strengthened his faith, so that he had ceased to consider his own age, or the deadness of Sarah’s womb: and God had fulfilled that promise, Isaac had been born. And now God commands him to kill that very child, with whom God had said he would establish his covenant. God’s promises to Abraham were centered in Isaac. In Abraham’s position I think I would have been very confused and hesitant and grieved; but Abraham rose up early and promptly went to carry out his duty. He knew that obedience to God will never result in forfeiting God’s blessing, however destructive obedience seems. And he knew something else: we don’t know at what point he came to this conclusion, though I suppose it was at some point on the journey to Moriah. But as we learn from Hebrews, at some point Abraham came to the conclusion that if he killed Isaac, God would raise him from the dead. The Bible doesn’t say that God told him that. I believe he reasoned his way to that conclusion. He had two things to work with. One was that God had told him to kill Isaac, and he was committed to doing just that. The other was that God’s promises could never fail. And that meant that not even the death of Isaac could interfere with the fulfillment of God’s promise – God would bring him back to life if that was what it took. And God confirmed that faith in Him, that belief in resurrection, in giving Abraham a figure of the resurrection when Isaac was spared (Hebrews 11:17-19). Is it any wonder that Christ said that Abraham saw His day? Abraham saw salvation by a substitutionary death, and resurrection by the power of God in faithfulness to His promises. Abraham’s faith in God as the Just and Supreme One Whose word is unquestioned, and whose faithfulness and power limitless enabled him to obey the hardest commandment laid upon him. May God give us grace to have a similar faith, that we may obey as much as our father Abraham. The record of Abraham’s failing in the exact point where he was strongest, his faith, show us that it wasn’t his superhuman virtue that enabled him, but the grace of God: and what the grace of God did in Abraham, the grace of God can do in us. When we see Christ taking our place, and the Father lifting up His hand against Him, and then again when we see Christ rising from the dead, how can we doubt that we must give Him first place in our minds and hearts, that we must surrender all to Him to do with it as He sees fit; and how can we doubt that He will abundantly satisfy all those who put their trust in Him? Thus both salvation and damnation hinge entirely on whether we believe or do not believe. The sentence that closes and denies heaven to all who have refused to accept this faith in Christ has already been pronounced with finality. For this unbelief retains all sin and cannot obtain forgiveness, just as faith delivers from all sin. Hence without this faith everything, including even the best works and life of which man is capable, is and remains sinful and damnable. Good works may be praiseworthy in themselves and commanded by God; but they are vitiated by unbelief and for this reason cannot please God just as all the works and life which spring from the faith of a Christian are pleasing to God. In brief, without Christ all is damned and lost; in Christ all is good and blessed. Therefore even the sin inherited from Adam and still dwelling in flesh and blood does not have to harm or damn us. But one should not understand this to mean that sin is permitted, that one may sin and do evil without restraint. For since faith brings forgiveness of sin, and since Christ came to remove and destroy sin, it is impossible for anyone who lives openly, impenitently, and smugly in sin and according to his lusts to be a believing Christian. For where there is such a sinful life, there can be no penitence; but where there is no penitence, there can be no forgiveness of sin either, and consequently no faith, which received the forgiveness of sin. On the other hand, he who has faith in such forgiveness resists sin and does not give way to its lusts but contends against it until he is rid of it. And although we cannot be completely rid of sin in this life, although it still remains even in the saintliest people, yet believers have the comfort that this is covered by Christ’s forgiveness and is not reckoned for their damnation if they continue to believe in Christ. Here the words of St. Paul in Rom. 8:1,4 apply: “There is therefore now no condemnation for those who are in Christ Jesus, who walk not according to the flesh.” Also the words found in Gal. 5:24: “And those who belong to Christ Jesus have crucified the flesh with its passions and desires.” Behold, these are the people who are told that sin will not harm or condemn them. To the others, the unbelievers and reprobates, no message is given here. 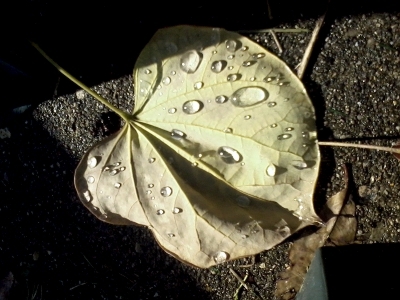 And only my eyes have seen this fallen leaf. Have traced this fallen thing with all creation�s shimmering. Across the surface of the myriad of lives. For any other heart to walk beside. These three are the great warrant that a sinner has to roll himself over on; a complete Mediator; a faithful God promising to answer all grounds of fears, doubts and jealousies; and free grace, which answers all challenges that may come in to hinder his closing with, and resting on the promise. For if it should be said, �How dare you lay hold upon the promises?� The answer is, �It is free.� It is not the mount that may not be touched, but it is Jesus the Mediator of the new covenant, etc. It is grace that is the rise, the end, and the condition of it. These are the three on which faith yields itself to Christ, and which are the object of it, on which it dare hazard, and on which it does hazard; and these three are revealed in the gospel of the grace of him that is faithful, and cannot deny himself. May we not then say, �O sinners, if you will believe that, you have a good resting place,� a sure Foundation, a tried Cornerstone, as it is Isa. 28:16 cited Rom. 9:33, where the apostle has it, He that believes on him shall never be ashamed. There is a sufficient surety, a full Mediator, there is a faithful God that will keep his word, and there is a free covenant and promise, softer a bruised soul to roll itself over upon, than any bed of the finest downs is for a weary and crazy body. This is a chariot paved with love for the daughters of Jerusalem. Single out Christ from all that is in the word, without slighting any part of it, and believe in him and lippen to him; let him have another weight and lift of you than you give to any other thing; he is able to bear it, and God will never quarrel you for so doing, but will keep his word to you that do betake yourselves, or that have betaken yourselves to him. He that believes shall never perish, nor come into condemnation. O! know what a ground you have to rest upon; it is even the substance and marrow of all the Word of God. You have Christ and his fullness, God and his faithfulness, grace and its freeness. And are there such three things beside? Or is it imaginable or possible that there can be any beguile, or failure here? Spare not then to lay the weight of your souls upon it. Let it be the foundation of your peace, and let it answer all challenges that may be, whether for many, or for great and grievously aggravated sins. Only by faith take hold of this righteousness, and rest upon God�s faithfulness, and free promise to make it forthcoming to you. But upon the other side, O how great will it aggrege your guilt, that had such a remedy in your offer, such a tried cornerstone, elect and precious, to rest upon, and yet made no use of it! Let me exhort, beseech, and even obtest you, That ye receive not this grace in vain. But as Christ is laid for a sure Foundation, so come to him, and build upon him, that you may not be ashamed in the day of the Lord, when all the believe not, how presumptuously so ever they may hold up their heads now, shall be ashamed and confounded, world without end. O happy, thrice happy will they all be found to be then, who have trusted in him.